When the former Soviet Union sent the first human being into space, it already had a clear advantage over the US in the space race. In 1957 it had successfully put into orbit the first artificial satellite in history, Sputnik 1, and had also sent the first living creature to the cosmos, the celebrated dog Laika. The next goal was for the military pilot Yuri Gagarin (1934-1968) to go into space and, unlike Laika, to return to Earth to tell the story. This is how that historic day went. April 12, 1961. The sun has not yet risen. It is half past five in the morning at the Baikonur Cosmodrome, the Soviet space facility located on the steppes of present-day Kazakhstan. Gagarin, 27, opens his eyes, ready to make history. Unlike Sergey Korolyov, chief designer of the successful Soviet space program, Gagarin has slept well. The data from the sensors that he wears on his body confirm his calmness: blood pressure at 115/60, a heart rate of 64 beats per minute and a body temperature of 36.8°C. Born on a collective farm west of Moscow in 1934, Gagarin is an experienced pilot and parachutist, with a special empathy. In addition, his reduced stature (1.57 metres) made it easier for him to be chosen out of 20 candidates, due to the small size of the space cabin. After a breakfast consisting of the contents of two 160-gram tubes, one with pureed meat and another with chocolate sauce, Gagarin is helped into an orange space suit—the eye-catching colour chosen to facilitate a possible rescue—and a white helmet. At about 7 a.m. he enters the Vostok 1, a spacecraft with a length of just over 38 metres and a total mass of almost 290 tons. Two hours later, everything is ready for the launch. The five engines at the base of the rocket start their ignition and, at 9:07, Gagarin lifts off to the cry of “Poyekhali!” (“Off we go!” in Russian). 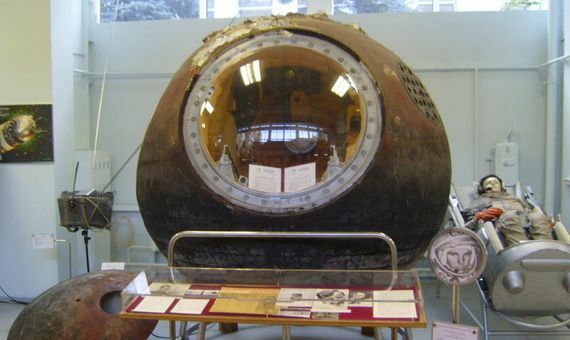 The flight of the Vostok 1 is planned to be fully automatic, since it is unknown how the human body behaves in space. One hour into the launch, after verifying that the mission is progressing successfully, the official Soviet news agency broadcasts what until that moment had been an absolute secret: the Soviet Union has just put a human being into space. It is one of the great news stories of 1961, the same year in which John F. Kennedy takes office as President of the United States and the Beatles appear at the Cavern Club in Liverpool. The spacecraft does a single orbit around the Earth, at an average altitude of 315 kilometres and a speed of 28,000 km/h, and then re-enters the atmosphere. There is a powerful deceleration (8 times greater than the force of gravity), and the Soviet pilot has to withstand, without fainting, an eightfold increase in his weight. When Gagarin is 7 km above sea level, he uses the ejection seat to leave the cabin and at 2.5 km the main parachute from the spacecraft opens. The flight lasts a total of 108 minutes. At 11:05 a.m. Yuri Gagarin lands near a village in the Saratov region (in present-day Russia) on the right bank of the Volga River, where he has to explain to some farmers that although he “comes from space,” he is a Soviet, like them. Despite being a resounding success, the flight of Yuri Gagarin did have some setbacks. 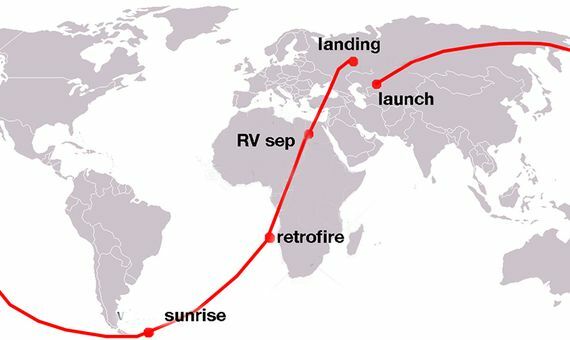 The most significant occurred during the descent to Earth, when the service block unexpectedly remained attached to the re-entry module by a bundle of wires. Although they ended up separating thanks to the heat caused by the friction with the atmosphere, the cabin experienced unexpected gyrations that diverted the landing almost 1,400 kilometres to the west of the predicted location. Even so, Gagarin returned safely after becoming the first person to see our planet: “The Earth is blue. How pretty. It’s incredible,” he said in mid-flight. 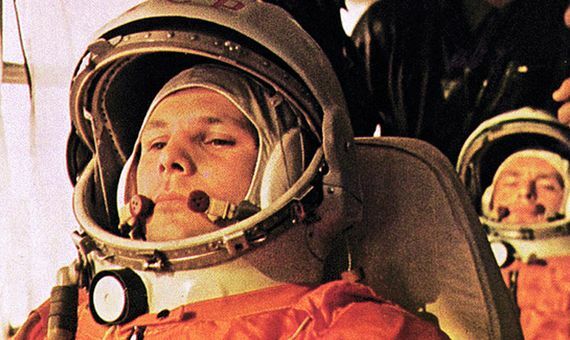 Becoming a Soviet national hero and a global symbol, Yuri Gagarin curiously never returned to space and would die in a strange plane crash in 1968.